Binding of oxygen in the blood to hemoglobin is affected by a number of molecules that compete with O2 for the heme sites. In particular, carbon monoxide binding to the heme sites is one to two orders of magnitude greater than oxygen binding. The following analysis of a hypothetical two-site hemoglobin with both O2 and CO dissolved in the blood is given below. 1 If the liquid (blood) is in saturated with O2 in air while the binding equilibria are attained, L, not Lo is constant. Except for Kil and the two-order-of-magnitude factor between it and Kim, these equilibrium constants have been chosen arbitrarily. The only restriction was that the dissociation constants of the di-liganded hemoglobin be smaller than the mono-ligand value in order to represent cooperative binding. The mixed di-ligand equilibrium constant, Klm, was assumed to be the geometric mean of K2M and K2L. As shown below the Klm is related to the preceding equilibrium constants. Possible combinations of bound ligands are shown below. The sites on the hemoglobin molecule are drawn as vertical line segments. The last of these equations shows that KLMK1L = KMLK1M, so that KLM is not an independent equilibrium constant. The calculation assumes that these concentrations are established by equilibration of the liquid (blood) with air with a variable partial pressure of carbon monoxide. 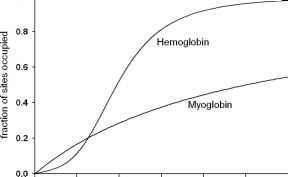 Equilibrium with hemoglobin takes place out of contact with air, so that [Lo] and [Mo] are the fixed total concentrations of the ligands, bound and free. The horizontal line in this graph shows that oxygen binds to Hb as if CO were absent, irrespective of the CO partial pressure. The constant value of fQ = 0.068 means that X = [L]/[Lo] << 1, a result shown in more detail in the O2 curve in the bottom graph. CO binding does not start in earnest until its partial pressure is ~ 0.2 atm, where the concentration in solution is ~200 mM (top). Thereafter, binding increases until at 4000 mM (4 atm partial pressure) ~ 95% of the total sites on hemoglobin are occupied by CO molecules. 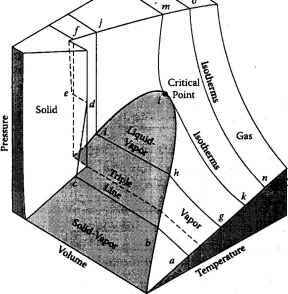 At any CO partial pressure, less than 0.1% of the available CO remains in solution (bottom).